Peruse these homemade birthday card ideas to get inspired. Many of them can be made with objects you already have around the home, like buttons or birthday candles. Whether you’re a crafty maven or DIY novice, these DIY birthday ideas will have you creating works of art in no time. You may never need to buy another card again! This puppy dog design from mmmcrafts has a tongue-pull tab and floppy ears. Kids and dog-lovers alike will appreciate this homemade birthday card. For added personalization, write a special message on the doggie ears. This DIY birthday card tutorial from The Postman’s Knock is perfect for making a collection of cards to have on hand because it is gender-neutral. It also utilizes items you already have around the house, such as scrap paper and even a paper grocery bag. The sherbet colors and three dimensional details of this ice cream cone design by Stampin’ Everything! make this card a delectable treat! Try different colored paper for the sundae of your choice, and don’t forget to add the cherry on top! This ingenious DIY birthday card design by One Good Thing couldn’t be simpler. Blogger Jillee used scrapbook stickers to make her own greeting cards in less than 30 seconds. Since the stickers often come in packs of three or four, you’ll have supplies on hand for next time. The confetti details of this design by Blush Crafts might take a little bit longer to arrange and glue, but the end result is worth the extra time and effort. It’s the ultimate card for a girly, crafty girl, and she’ll love that you put so much time into her card! Often, homemade cards are decorated with glitter and frills, but the color scheme and simple look of this Playing With Paper card makes it perfect for dads, brothers and sons. Use the same template with different prints and ribbons to utilize this versatile idea. 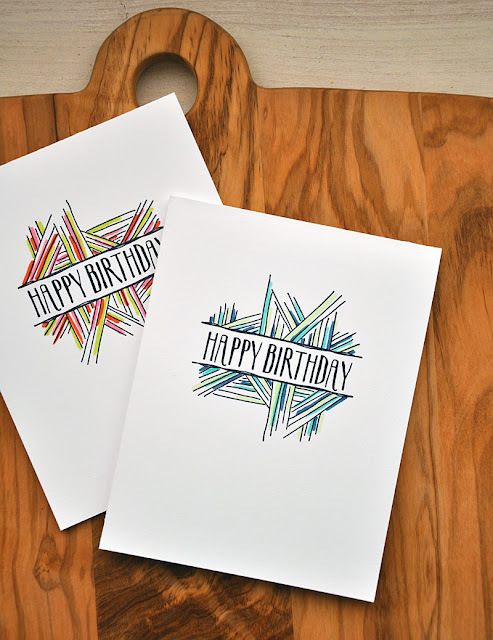 The background of this sweet card design by Snippets By Mendi is made with washi tape and a “happy birthday” stamp. The final touches are made with a circle punch and an ice cream cone sticker. This could be great for a young girl’s birthday. Who doesn’t love a little glitter? This glittery, colorful card made by Creative Me Inspired You is great for kids, but works for every age group. A fabulous birthday card with chunky glitter and rainbow colors really adds to the festivities! This cute balloon design from Passionate For Paper calls for strips of leftover paper on the outside of the card, mounted with foam tape for visual interest. When open, the balloons pop up for a fun 3D surprise! Add a birthday wish inside using your favorite stamp and your card is all set. This fun and creative card design by Snippets has the look of a woven basket. All it takes are quarter inch strips of paper scraps woven through slits in the cardstock. Try pairing the “woven basket” card, with a yummy fruits and snacks gift basket. Expressions of Me first embossed watercolor paper, then colored over the embossing with bright distressed ink for this artistic card. We love the speckled texture of the balloons! Choose a variety of fun water color inks to create a marble-like painting on your balloons. Paper doilies make an adorable background for this cupcake birthday card design by Kitchen Table Stamper. This is the perfect treat for the sweet tooth in your life! Check out the link for instructions on how to make an adorable matching gift bag. Washi tape gets a starring role in this simple design from Omiyage Blogs. Use a variety of colors, widths and lengths to craft a simple but unique birthday candle card. Washi tape also lends itself perfectly to layered cakes and cupcakes. The nuts and bolts of this manly design from Maggie Made Cards are guaranteed to please the guy in your life! Blogger Maggie spelled out the first word, and then used a stamp marker to color in “about you” from a stamp that says, “finally a day about you.” Using two different stamps expands your stamp collection and looks great on a card. This post from White House Crafts combines pom poms and a free printable with instructions on how to make a multi-dimensional waffle cone. With an added three dimensional feel, opening a card with so much texture makes for a sweet surprise! Even though this birthday card design from Contagiously Crafty calls for tulle and glitter, the bold sentiments and color scheme keep it from looking too overwhelming. Have the recipient shake the card before opening to see your special message on top the card. Bright, happy colors? Check. Adorable puppies? Double check. This birthday card from Mayholic Design features ombre inks and black gemstones for even more interest. Gift this card to the ultimate dog lover, they’ll get a kick (or bark) out of it! Simple and stunning, this geometric design from Simply Stamped features black ink and a pop of color. This is an ideal birthday card for someone who appreciates a nice pop of color. Your creativity and attention to detail will leave them awe struck. The real candles on this homemade birthday card from Pixels and Glue make it pop with dimension, and can be saved for later! You’ll need to make this one before the big day, however, as the black stamp on vellum needs some time to dry. The Little Koo Blog went for a simple sentiment on top of a pretty patterned paper. Instead of writing in a square, make it more interesting with a banner displayed across the card. Add your unique birthday message within the banner. Perfect for those in a long-distance relationship, this homemade card from Happy Go Lucky consists of a whole week of birthday messages. Double-sided tape and repurposed cards add up to a special gift that can be opened every day of the week. A shaker card contains a moving item in the front part of the card, and this shaker card has an adorable birthday wish in the front. For a great birthday card idea, follow the step-by-step instructions by Mohinicraftyz here. This DIY birthday card by Grâce Belle only takes 15 minutes to make and uses minimal supplies. In fact, you probably have all of them on hand right now. Try with hand lettering and an ink pen for a beautiful presentation. Contrast your balloon color with a bright card underneath. We’ve all been in that position where we needed to make a quick stop on the way to a birthday party. With this fast design using self-inking stamps from Almost Makes Perfect, you can save yourself a trip and still bring a beautiful card. Colorful, three-dimensional balloons are the hallmark of this card from STUDIO XTINE. Personalize the card by making the number of balloons match the recipient’s birthday. This card features 25 balloons for a friend’s 25th birthday. The delicate details on this gorgeous paper dress design from Baukje’s Cards and Crafts come from the time spent embossing and dahlia folding on double sided design paper. Give to a fashionista who will marvel at the work put into her paper dress card! This creative project dreamed up by Kelly Griglione for Winnie & Walter, LLC can be customized with the birthday year of the recipient using playing cards. It’s absolutely perfect for your bridge partner or poker playing friend. Kristina Werner used an inexpensive watercolor set for this simple and easy DIY birthday card. You don’t need to be an art major, either. It’s just painting stripes and drawing black lines. Check out her how to video on YouTube for specific instructions! Not only is this pop-up, 3D cake card design by Red Ted Art perfect for a birthday, it could also be used for a wedding or any occasion that calls for cake! This cake card needs only a few simple household items (baking not required). Baker’s twine, washi tape and a stamp (or really good hand lettering skills) are all you need for this chic and simple homemade birthday card design from A Step In the Journey. With this tutorial, you can whip up a masterpiece in under ten minutes!